The X Factor final was the UK's most watched show of 2010, viewing figures have suggested. 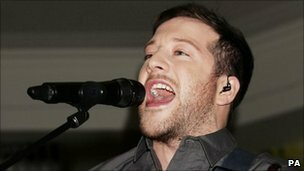 According to overnight numbers provided by ratings research board Barb, 17.7 million tuned in to see Matt Cardle named the winner on ITV1 and ITV1 HD. Consolidated figures, which take into account people watching shows they have recorded, are yet to be released. England's World Cup match against Germany on 27 June was seen by 17.4m on BBC One and BBC One HD. These figures - based on the more accurate, consolidated measurement - make it the second most watched programme of 2010. Peter Fincham, ITV's director of television, called the figures a testament to "the enduring popularity of high-quality television content broadcast free-to-air to mass audiences". The figures form part of a Top 10, compiled by ITV, of "most-watched" programmes over the year to date. It ranks the most-watched edition of popular shows against each other in order to form a picture of 2010 viewing habits. An episode of EastEnders shown on 19 February, seen by an average of 16.4 million, puts the BBC One soap in third place. Coronation Street comes fourth in the rundown, based on the 14.7 million who watched the ITV1 soap on 6 December at the beginning of its 50th anniversary week. ITV's coverage of England's World Cup match against Algeria on 18 June - seen by an average of 14.6 million - puts it fifth in the chart. Yet the pivotal match in England's World Cup group - seen by 21.3 million at one stage - is notable for achieving the highest peak audience viewing figures of the past year. All figures relate to 2010 programmes broadcast before 22 December.